By now, you have heard that Adobe officially announced CS5.5. Of course, I warned you about this last year when I was part of a survey to see how creative developers would respond to the idea. I hated it back then and still do. At its core, CS5.5 is about adding HTML5 development to the Adobe suites. This is in response to Apple’s continued prohibition of Flash on the various iOS4 platforms (iPhone, iPad, iPoop, etc.). So, CS5.5 is all about making Apple happy. First of all, 2011 is a very different place. By all analyst projections (Nielsen, IDC, Canalys, comScore, etc), Android will overtake the iPhone as the most used smartphone platform this year, if it has not already done so. And, as of Android 2.2, Flash has found a home on this new smartphone leader. So, do we really need CS5.5 to develop for Apple’s fading platform? Again, I say NO! But, most annoying is the cost. Adobe does not have the confidence in this release to call it CS6. Photoshop remains at CS5. Instead, it is a half update. Yet, they are charging FULL price for it. (OK, so it’s $100 less than the CS5 upgrade.) And, if you do buy it, don’t expect any additional discount towards CS6 whenever that drops. Based on past experience, if Adobe offers a discount for CS5.5 owners, it will only be $50 less than CS5 owners. 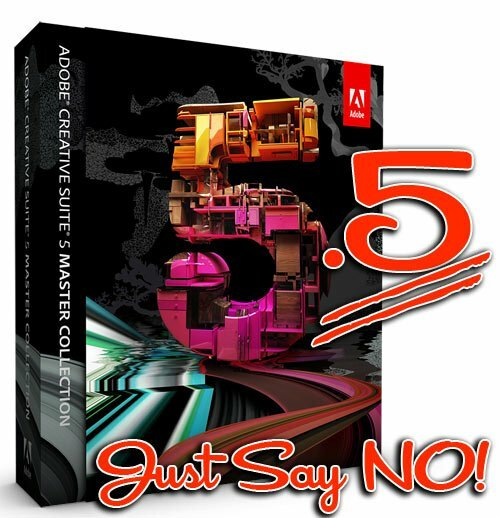 How could Adobe force you to purchase CS5.5? Camera Raw. With every prior Suite release, Adobe has included a new version of Camera Raw. When this happens, the support for the previous version ends. If this happens and Canon finally releases the 5D Mark III, 7D Mark II and 1Ds Mark IV, expect only the current version of Camera Raw to support these new Raw formats. Older versions of Camera Raw in older Suites are never updated for new cameras. Of course, Adobe Lightroom 3 would be updated to support new cameras (at least until Lightroom 4 is released). Considering how closely tied Lightroom and Camera Raw are in their development, Adobe would definitely have to explain any differences in support. Just remember … there is always Canon’s Digital Photo Professional (DPP) and it’s free! Your fear over Camera Raw is unfounded. Thanks for the clarification Jeffrey! I am still passing on this update. Even if you never upgrade again, you can always convert your raw files to dng using the free Adobe DNG converter to open them in the version you have. While I can appreciate different tastes and preferences, it seems you really dislike iOS. I don’t see what the big deal is. Flash is already available on Android, so if you’re not into iOS what difference does it make? As far as placing any weight on the “analyst” opinion (needless to say, you claimed “all” analyst)… there is only one truth here — analyst guess. And, looking back on the analyst track record (especially with Apple) over the past couple years (since the iPhone came out) the one thing for certain is that the majority of the analysts have been wrong. DEAD WRONG. 100% of the time. (again, I stress “the majority” of analysts). If Android development or use is your thing, great. But, you can’t ignore the market share of iOS. It’s not going anywhere. Android, no doubt, will be extremely successful over then next quarter and beyond. But the failure in thinking here is to assume that if one succeeds the other must fail. Android can be wildly successful, even surpassing Apple’s iOS… but that doesn’t mean that Apple’s market share will go down. It will, most likely, continue to grow. The majority of analysts aren’t considering this — they assume that there can only be one king and everyone else will fail. To believe that, one must assume that Apple currently owns 100% market share and that for Android to succeed would mean that they would have to steal market share ONLY from Apple. Keep in mind that Apple is still only the THIRD largest phone manufacturer out there. People who like iOS will continue to like it. Those who like Android will continue to like Android. And if Android passes the iPhone/iOS in sales I’m going to place my stock/money that they’re not stealing away all that market share from Apple. They’ll be taking it from older less adaptive technologies. Love Apple or hate them, they will remain successful as long as they continue down their current path — creating products that consumers enjoy, figure out quickly, and grow to love. But just because people love Apple products doesn’t mean they can’t also love products from another company. And that is where your logic misses the mark, with all due respect. Is that clear enough for you?? I’m a little annoyed at this myself. Why does it feel that rather than increase its customer base, Adobe seems more content to milk its currently existing one? I have been using CS5 for all of three months and some of our clients are already moving to CS5.5, so their InDesign documents are unreadable unless they give it to us in IDML format, which won’t always be a perfect conversion. And my organization needs at least three or four licenses. Adobe used to be a company that put its customer first. Now, they are all about making a profit (or trying to anyway). Their Creative Suites are so filled with bloatware that even Microsoft is embarrassed for them. It would be one thing if Adobe added features that their customers really want. But, with every release, the Suite gets bigger and requires more powerful computers. All of this hurts the freelance designer and small business owner that is struggling just to get by in this economy. And, Adobe’s response is to just keep increasing their upgrade costs! These comments above dissuade new entrants to the CS series. for us in Africa, the outlay to buy a standard or premium suite is pretty steep and the fear of having to compulsorily upgrade at the whims of the Adobe eggheads will again begin to look for a softer landing to access the CS. I hope Adobe will assure its users that it is not all about money.